Valentine’s Day Art – Uniquely Yours… or Mine! So I wanted to get a jump on Valentine’s Day decorations… I usually don’t decorate for it, but after taking down the Christmas decorations the house just felt a little naked…. This project was so fun and easy to do! And if you haven’t heard of Wordle you really should go check it out, *** WARNING *** Highly Addictive (and FREE)! 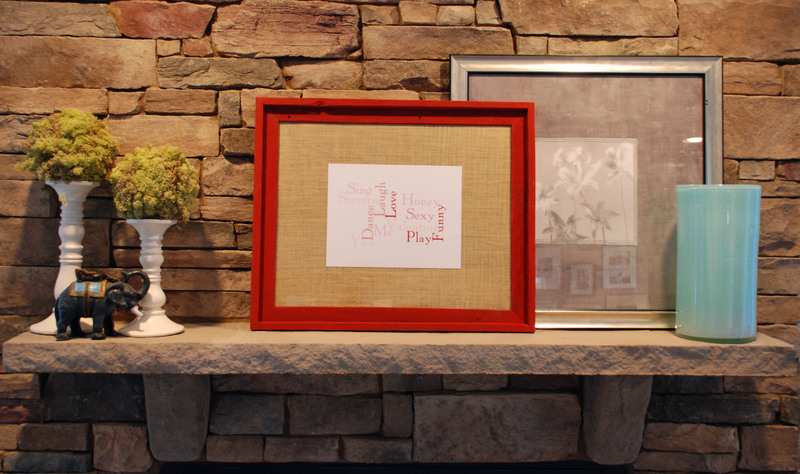 The supplies I used were: thick printer paper, burlap fabric, wood frame, mat board & red chalk paint, cost about $17. I designed my artwork in Wordle and printed it out on the thick printer paper, making sure that the printer settings were set to enlarge the image to fit the page. I had purchased a barn wood frame from Hobby Lobby, making sure to use my phone at the register to show the 40% off weekly coupon, and painted it using ASCP in Scandinavian Red. I didn’t try to completely cover all of the wood with the paint, but just applied it roughly. Also, because I wanted the rough texture of the frame to be maintained I didn’t apply a wax topcoat. I cut the mat board to fit the frame and attached the burlap fabric with an adjustable spray adhesive. I did consider cutting an opening in the mat to allow the art to be mounted to the back, but that was just more difficult than I wanted this project to be! So I just attached my “artwork” to the burlap with glue dots and I was done. I am very pleased with how this turned out… a plus is that it was so quick and easy! What do you think? Have you tried Wordle before? Previous Post: Oh.. Yeah.. I Got an Antique Apothecary Chest at a YARD SALE! Love Wordie! I can see that is going to be my new time vacuum! Thanks for sharing! This is a cute project! Coming from Tip Me Tuesday.